This Novomatic game offers a very similar experience to other ‘Buffalo themed games’ in that the game mechanic is uncomplicated and fairly typical and the focus is more on the theme. This may be in homage to the success of Aristocrats Buffalo game and developers are reluctant to stray off the track when it comes to large hairy wild animals. Try Buffalo Thunder for free before you deposit and play for real money. Fans of the 9-payline Book of Ra slot, or its far cooler younger brother, the 10-payline ‘Deluxe’ version, will know that the two games’ creator, Novomatic, know a thing or two about video slots. In fact, the firm has become a byword in recent years for slick, intuitive slots-play. Novomatic have deep roots in the land-based market, even branching out into online. Luck Lady’s Charm, Columbus, Dolphin’s Pearl and Reel King: all have entered the little black books of slots fans looking for a late-night excursion with a casino beauty. 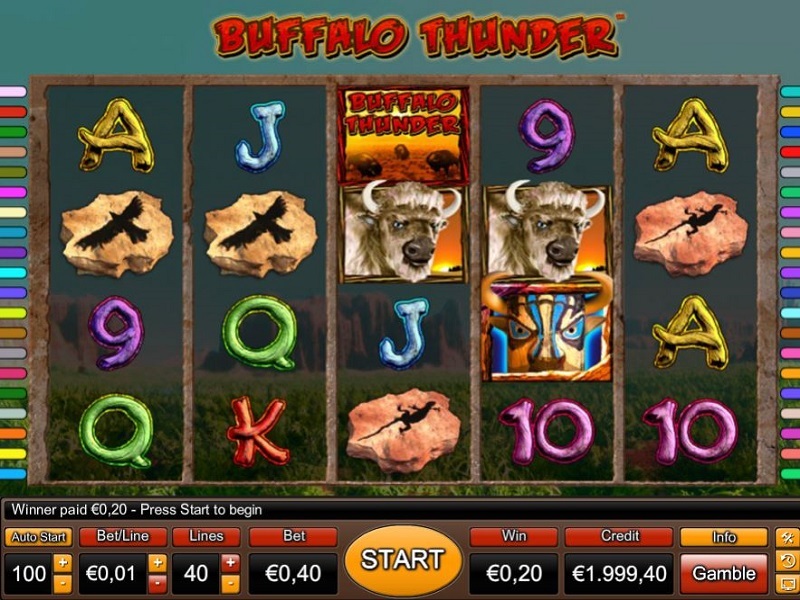 Buffalo Thunder is a worthy addition to Novomatic’s arsenal of video slots, and certainly has elbows ample enough to muscle in on the crowded bench marked ‘buffalo-themed slots’. As with WMS’s Buffalo Spirit, this 5-reel, 40-payline game sees you right in the midst of a Wild West plain. No wonder the game is popular in the casinos of the US: it’s a romantic trip across the prairies all the way, a time when herds of buffalo roamed free, Civil War raged, and Las Vegas was a mere twinkle in the eyes of a thousand hungry property developers. As well as the 10-through-Ace symbols, familiar to most games, we get Native head-dresses, Cavalry hats, prairie wagons, howling coyotes, the totemic American eagle, and the thunderbolts which give the slot its name. All that’s missing is John Wayne staggering across the reels and we’d have the whole set. In fact, it’s the black and white buffalo who pay out the best, so they’re worth watching out for. The Buffalo Thunder logo acts as the game’s Wild, and substitutes for every symbol other than the Totem Scatter. Bag a Wild or three and an animated buffalo hurtles across his space on the screen. It’s not quite as swe-inspiring as the full-on animation of Buffalo Spirit, but it still inspires. The Totem Scatter triggers free spins. Get three Totems on Reels 2, 3, and 4 and you’ll get five free games. They can be re-triggered too, so it could add up to a nice little payday. And if the YouTube video posts are anything to go by, it seems plenty of land-based Buffalo Thunder players are winning big. Not as all-out exciting as Buffalo Spirit or offering anything as gimmicky as the X-Way system of IGT’s Thundering Buffalo, the tech on display makes Novomatic’s offering just as special. Learn more about Buffalo Thunder in this short video, which showcases all the key elements of the game. Find out which symbols are the highest paying and what you need to do to trigger the feature – it will be well worth a few minutes of your time.